The Mallard Forklift Separator FL-300 is designed specifically for deep-lane, multi-level pallet flow configurations. Like our other pallet separators, the FL-300 is designed to hold back rear pallets from exerting force on the front pallet thus allowing for simple extraction of the front pallet. The forklift separator is triggered once the front pallet is lifted by the forklift, allowing the rear pallets to then gently glide forward to replenish the pick face. Once the front pallet is in place, a hold-back device is automatically triggered to stop the rear pallets a safe distance from the front position. Isolating the front pallet and removing back pressure of the rear pallets is even more critical at higher elevations where forklift mast capacity is reduced. Back pressure is the combined weight of the rear pallets that transfers to the front pallet. When left uncontrolled, back pressure can injure workers, and damage inventory and equipment. Mallard pallet separators can change all that. 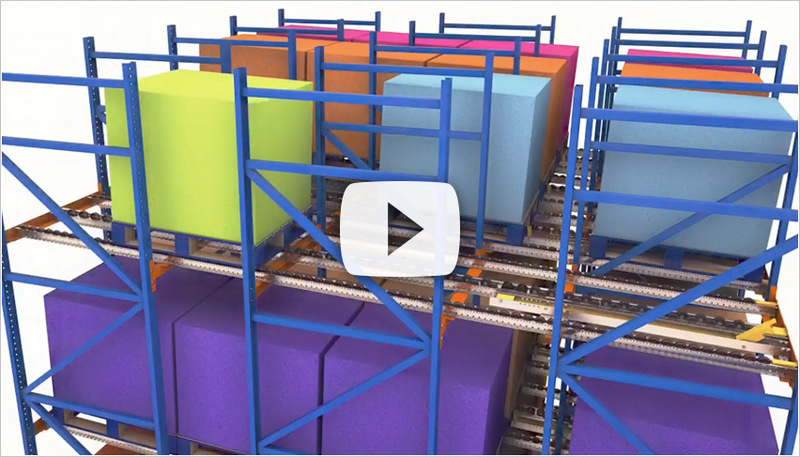 The 3D video above shows how quickly and easily the forklift separator works. E.g. .06 x 1200 x 5 = 360 lbs. of extra weight pressing down on the front pallet. In a deep-lane configuration that amount can multiply into the thousands! Now that you’ve removed the back pressure in your pallet flow system, boost the productivity of your pick line with these simple yet effective pallet flow lane accessories. Speed Controllers – drop-in or undermounted braking devices slow advancing pallets and maintain safe, even-tracking down lane. Entry Guides – mounted on both sides of the lane, assist forklift drivers in centering pallets for loading. Ramp Stops – bolt-on accessory gently slows pallet to a stop at the pick face and helps hold pallet securely in lane. 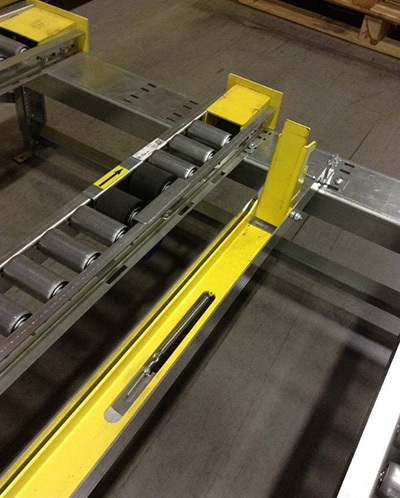 Bolt-on design means that if the stop is damaged, only the ramp stop needs replacing not the whole pallet flow rail. Download our pallet separator brochure to see the whole line of customized pallet flow lane separators available from Mallard. Contact the Mallard gravity flow experts to discuss outfitting your new or retrofitting existing pallet flow lanes with safe, efficient pallet flow separators.